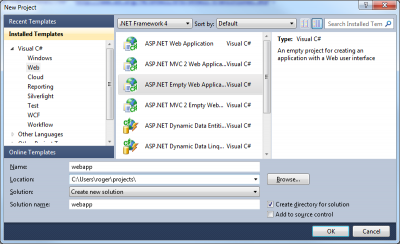 Run visual studio 2008, go to 'file/new/project' and select 'ASP.NET Empty Web Application'. Running this project will open your default browser and show a directory listing of your project. 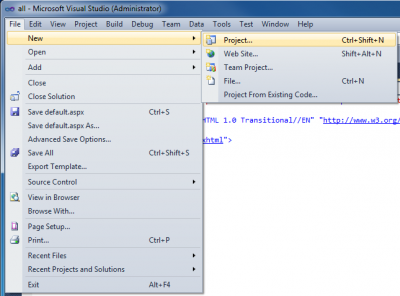 To add a default (empty) page, in the 'solution explorer' right-click and select 'add/new item'. 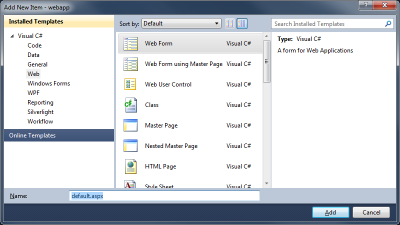 Select an "Web Form", name it "default.aspx" and click on add. Now running your project notice your browser redirects you to the '/default.aspx'-page - which is still empty. Now let's take a look at the web.config. 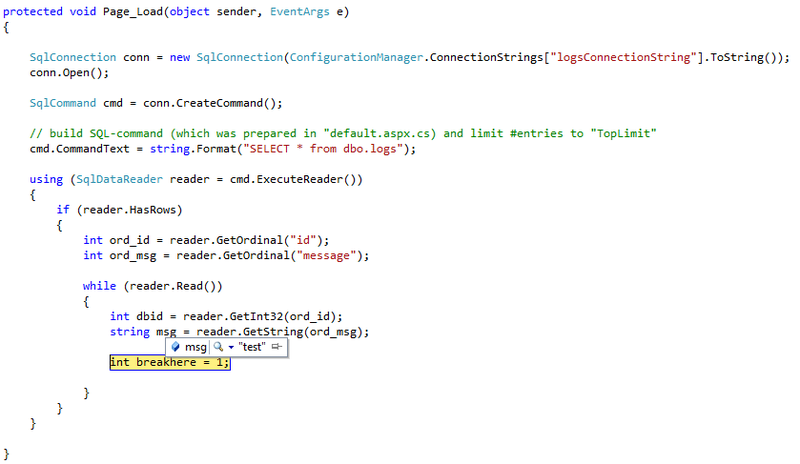 In the solution explorer double-click on the 'web.config' to open it and add the statement as marked below. Now it would be nice if we could get this string from within the asp-page. 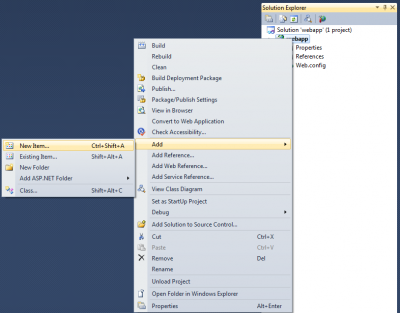 In the solution explorer find the 'default.aspx' entry and open it. It will show two subfiles, being 'default.aspx.cs' and 'default.aspx.designer.cs'. Open the default.aspx.cs and you will see a method called Page_Load(...). Add the code as displayed in the below screenshot. 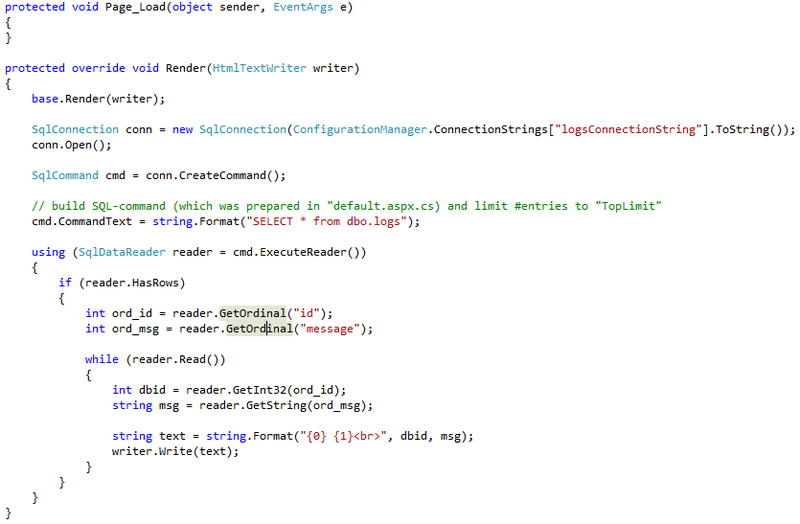 You can just copy the two lines in the function and right-click on 'SqlConnection' and 'Resolve Dependency' - do the same for ConfigurationManager (it will then automatically update the 'using' statements at the top as necessary). Now put a breakpoint on the line "int breakpoint = 1" and run your application. In the watch-window, verify that the string you entered into the web.config previosuly is correctly retrieved. We open an SqlConnection to the database specified in the web.config. 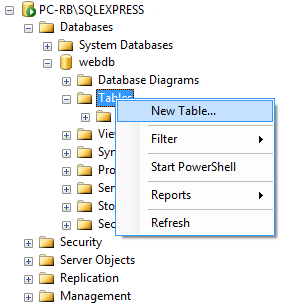 Then we create a query to select 'everything' from the logs-table. Then we loop through all resulting entries. These should match with the dummy-values you entered previously in the database. Now instead of hardcoding everything, we can use stylesheets (css). Open the file default.aspx. Add the block as shown below in the screenshot. 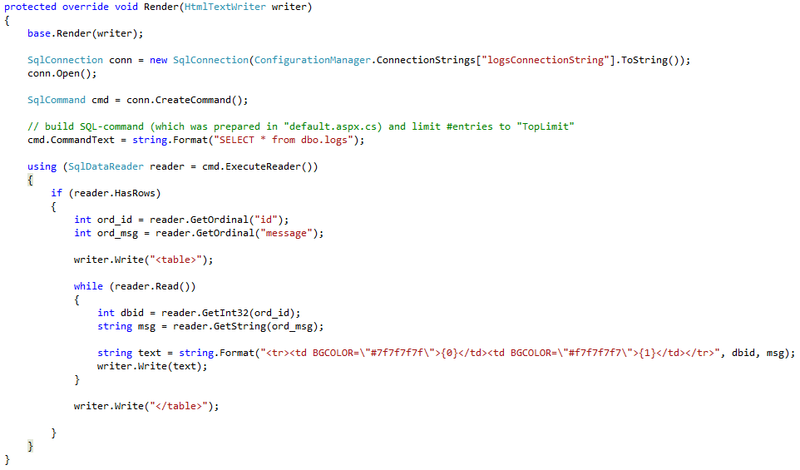 Notice the ".d" and ".detail" in the style-definitions, and how to use it in the code-part of the project. If you use an image multiple times, it will be fetched multiple times from the server. Imagine a large database table where you have a limited amount of images, but many entries. Loading such a page will be slow. We can use a small trick: We add all images into one large image, and use offsets to render the correct one. This can drastically speed up your page loading-time.